The winter is a time of great cheer, holidays, and celebration – but it’s also a season for sky-high energy bills. The frigid temperatures can really put a dent in your wallet, especially if you live in an older home with poor insulation; or if it remains extremely cold in your area throughout a majority of the season. So, how can you reduce your heating costs? Check out the article below, and we’ll go over our 7 top tips that will help you stay comfy – without eye-popping power and gas bills each month. Let’s get started! 68 degrees is the “sweet spot” for heating your home in the winter, according to the Department of Energy. Most folks will be comfortable inside in just a pair of pants and a sweater, and you can always bundle up a little bit more if you need to. Making this change can easily save you 10% or more on your heating bill, especially if you tend to keep things warmer. Of course, you don’t have to go as low as 68 degrees – but if you typically set your temps at the high or mid-70s, you should seriously consider adjusting. 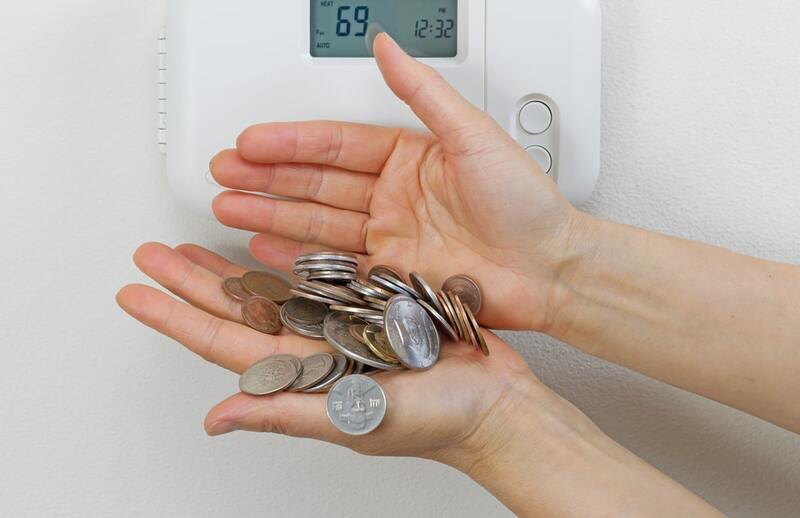 You’ll save quite a bit on your heating costs, if you do! You may also want to consider setting your thermostat lower at night, when you’re bundled up in bed. Dropping it by a few more degrees – and then raising it again when you wake up – will make a noticeable dent in your heating costs. A programmable thermostat can cost up to $100 – but in the long run, it will save you much more money than that; both in the winter and the summer. This is because you can set your thermostat to automatically adjust the temperature. For example, if everyone is at work or school during the day, after 8 AM, the thermostat can drop the temperature to 60 degrees – and pop back up to 68 by 4 PM, when your family will start coming home. The same is true at night. You can just program your thermostat to drop the temperature between 11 PM and 6 AM, and you’ll never have to remember to do it yourself. This is an often-overlooked energy savings tip. Your hot water heater typically can heat water up to about 140 degrees F – and this is not really necessary. If your heater is set to 140F, it will heat the water and maintain this water temperature all day long. If you reduce this temperature to about 120 degrees, your water will still be hot enough for any day-to-day task – but you can reduce your power bill by quite a bit. Consult your owner’s manual to find out how to adjust the temperature setting on your own water heater, or call a professional if you’re not comfortable doing it yourself. Your windows are a big source of heat loss, even if you have modern, double-glazed windows with nitrogen between the panes. One great way to reduce the amount of heat loss in your home is to cover your windows up. Cellular window blinds are the most effective at preventing heat loss, but they can also be paired with curtains for even more insulation. When it’s not dark, though, we recommend leaving your window treatments open, particularly if it’s a sunny day. The radiant heat of the sun will counteract most of the heat losses of leaving your windows exposed. If you’re cooking a meal on the stove, make sure the kitchen door is open and that the heat is circulating throughout your home. If you were using the oven to cook, crack the door open a little bit once you’ve turned it off, to spread the heat throughout your home. Leave the door open after you take a shower, so that the hot & steamy air helps to heat the surrounding areas. These may seem like little things (and they are!) but even these small steps add up to a lower heating bill over time. If your home seems like it’s losing warmth quickly, you could have drafts near your doors, windows, and other such areas of your home. One of the best ways to check for drafts is with a candle. Light a candle, and hold it near your doors and windows. Try to see if the smoke moves horizontally, or if the flame flickers excessively. This could indicate a draft or an air leak, which can usually be fixed with caulk or weatherstripping. You can never have too much insulation. A well-insulated home stays warm in the winter and cool in the summer – and will cost much less to heat and cool. The attic is one of the best places to add more insulation, as it’s easy to access. In addition, warm air rises. This means that, as your house is heated, the warmest air will tend to move upwards, and escape through the roof. One good way to see if your attic could use more insulation is to go outside after snow has fallen on your home. Look for patches where the snow has already melted – or see if your roof is already mostly snow-free. If your roof has little or no snow – but your neighbor’s homes still have snow on the roof – this could indicate that a lot of heat is escaping through your attic! Follow These Tips – Save On Energy Costs This Winter! With just a few minor lifestyle adjustments and home improvements, you can save quite a bit of money on your heating bill during the winter. So consider which of these steps may be applicable for you, and start saving today.